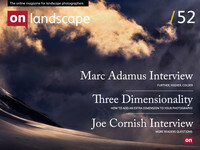 Marc Adamus is a photographer who has taken adventure landscape photography to extremes. His hero is Galen Rowell and he shares a lot in common with his lust for further, higher, colder, (insert hyperbolae here) and I would say if Galen were still around today and active his work wouldn't be too far removed from what we're seeing from Marc himself. Although he's based in Oregon, he has travelled and photographed much of North America. We contacted Marc after he released a batch of stunning images taken during 2012 and he answered a few questions for us and talked about a few images. We've transcribed the interview but have also included the recording (at the bottom of the transcription) if you wish to listen to it as a podcast. Tim: Okay, well I’ve put a few questions down, so I’ll just dig into those if you like? I noticed in your other interviews, because I had a look around online and I listened to a couple of podcasts, that Galen Rowell is a big inspiration. Galen started his vocation by climbing and not photograph, how did you begin your photography? Was it photography first or the outback back-packing first? Marc: Oh well, part of photography for me is just the product of a lifelong interest in every type of outdoor adventure, I just always really, really enjoyed getting outdoors. I got out of high school at 16 and I spent the time just scraping together whatever funds I could find through whatever means to pursue an interest in backpacking through the high country and getting out there in winter, doing some mountaineering and a little bit of amateur climbing as well, and I actually found Galen Rowell’s work through his climbing. I knew him as a climber through his many exploits around the world - he was regarded as one of the very handful of top climbers of his era. The climbing world was extremely familiar with him, and I at that time had a budding interest in photography but mainly just for the purposes of documenting my own trips and bringing those memories back for people. And when I saw what he was able to do with a camera as well, I think over time that really influenced me to take my photography more seriously.